Does this mean I'll have to raise the shield every time I don't use GNOME for a few minutes, instead of just wiggling the mouse? That would be quite inconvenient. Also, does this mean there would be a large uncertainty whether my station is locked or not? If I see a shield slide down, I assume "it's locked, I can go away". IIUIC now I'll have to raise the shield to see whether it's locked already, and lock it manually if it isn't. 3. Bob returns and realizes "oh damn, I forgot to lock my computer!" 5. "oh good, it automatically locked itself, great"
7. Eve, the attacker, comes to the computer, raises the shield and finds the session unlocked (the lock delay was still not exceeded). "This GNOME's confusing behavior is great, now I have full access to the system"
All this problems would go away if the shield automatically raised on mouse move/key press. But that wouldn't be so eye candy and awesomely cool I guess. The other solution is the present behavior where "shield == locked computer" and people can rely on it. I don't understand what the purpose is of showing a shield without locking the computer. It's just one extra screen that doesn't have to be there and blocks your view. kparal makes a valid point. That makes no sense (see my comment in the bug). At the same to you disable it on your own system. So why do you want to turn it on by default? I'd rather have this as opt in rather then opt out. kparal: There should be differentiation between locked and not (the padlock at the top-left of the screen at least), and locking the screen should be possible from the shield should be possible as well. The shield doesn't block your view, it's there when the screensaver was already on, which means the screen would have been blank. Unknown (aka drago): I don't disable it on my own system, I usually only change the background and the terminal's colours on my systems. The italics can be used for quotes, so it was supposed to be one (see also the beginning of the last paragraph). Opt-out rather than opt-in because the majority of laptops can suspend correctly. 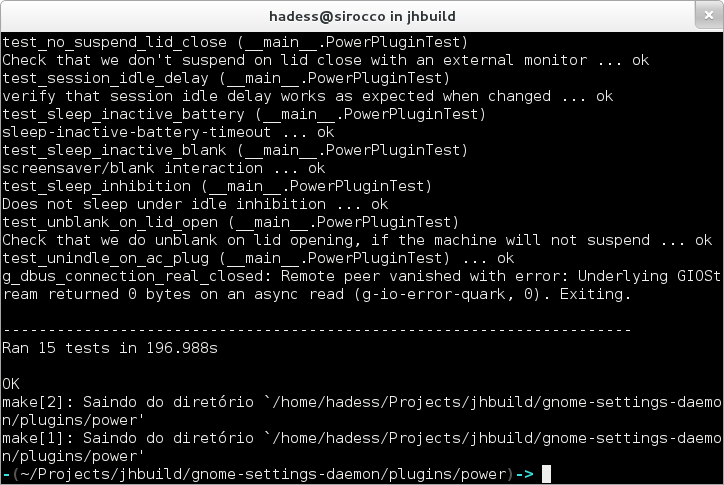 zdzichuBG: or "gnome-session-inhibit --inhibit suspend ssh somehost". This won't block the lid action though, so you'll need to either run systemd-inhibit for that ("systemd-inhibit --mode=block --what handle-lid-close:suspend ssh..." if it's the lid action you're trying to stop, or use office-runner if it's for a short period of time you're trying to keep your connections alive. Nice post Bastien, in my humble opinion well explained and detailed. Regarding to the quotation, it didn't cross my mind you were quoting somebody else, I thought you wanted to emphasize that it was your own configuration and somebody else could have something different. Maybe using quotation marks would have been clearer (beside the emphasis). Not a big deal, though. Looks great, Bastien! I've been hoping someone would clean this stuff up :) I look forward to using it. 2. the screensaver could have been disabled completely. That was my approach. What I like to have is an idle daemon. This is a daemon that run tasks on idle. "Your screen will now turn off as soon as the screensaver kicks in, moving your mouse in the screensaver will turn it back on for 20 seconds before turning off again"
I must say that I hate this functionality. I often have my computer sit idle while Im working at my desk and watch for notifications. I previously (3.6) had the blank/lock set to 60 minutes and would lock the machine manually if I had to step away, but with the new 'notifications on the lock screen' functionality, I was hoping I wouldn't have to deal with this problem. Now that my monitors turn OFF when the screen shield is activated, it means i have to either extend the idle time (meaning it could remain unlocked if i step away from my machine), or constantly keep the machine active so i dont miss notifications. Is there not a way to enable the lock shield after 10 minutes and blank screen after 30? Where is the point of having a beautiful and useful lock screen like that when the screen turns off as soon as it kicks in? I really, really hate this "improvement". I can't get it. It seems really like a bug. And no way to change that. Simply this is wrong. Am I missing sth or it is as it should be??? btw, did you managed to get proper behavior (i.e. 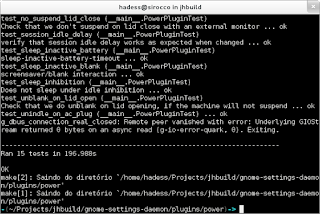 dimming then blanking) on your setup (I believe fedora as well)??? 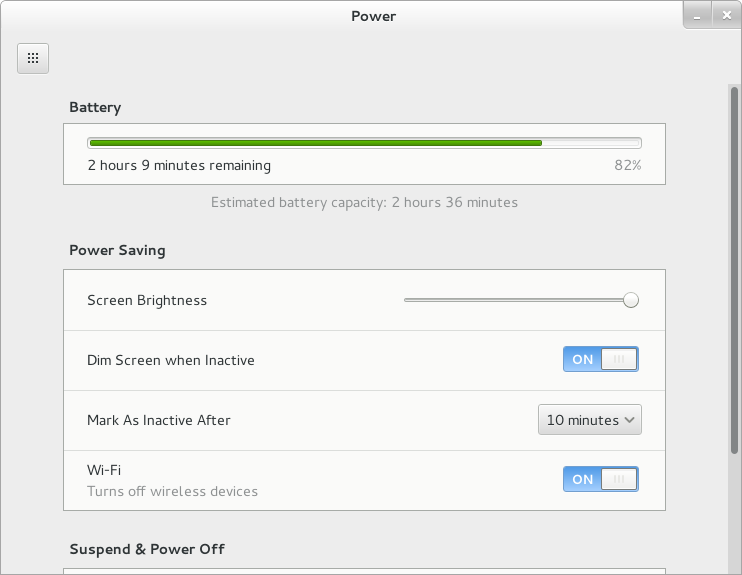 That's all well and good for laptops, but from a sample of 3 screens, one of them takes ~2 seconds to turn on, one takes 4 seconds, and the slowest takes 9. The one that takes 4 seconds is a CRT, and if it stays off for more than a few minutes, the picture appears washed out for a whole minute or so after it turns on. 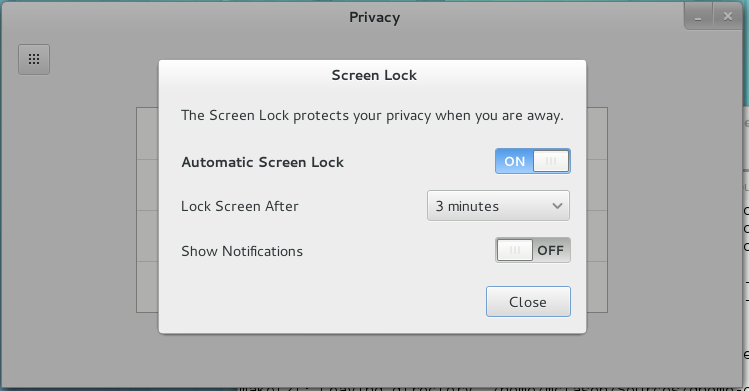 Turning screens on is not always a free action, so Gnome should give the user a configurable delay between activating the screensaver and turning off monitors with DPMS.